General Baron DeKalb was born in Germany in 1721. He served with distinction in the French Army during the War of Austrian Succession and the Seven Years’ War. In 1768 on behalf of France, he traveled to America on a covert mission to determine the level of discontent amongst colonists. In 1777, he returned with his protégé, the Marquis de Lafayette, and joined the Continental Army. On August 16, 1780, five miles north of Camden, SC, British forces under Lt. General Charles, Lord Cornwallis defeated the American forces under the command of Major General Horatio Gates. Gates had over 4,000 men, but only 2,000 were effective for combat. Many succumbed to the heat and also the night before, the men had been fed green corn, causing many to suffer stomach problems. Cornwallis had around 2,100 men. Six hundred were Loyalist militia and Volunteers of Ireland, and 1,500 were regular troops. Cornwallis also had the infamous and highly experienced Tarleton's Legion, around 250 cavalry and 200 infantry. The British troops opened the battle by firing a volley into the militia, followed by a bayonet charge. The militia, lacking bayonets, panicked and ran away. The panic spread to the North Carolina militia, and they also fled. Gates bolted with the first of the militia to run from the field and took refuge 60 miles away in Charlotte, NC. 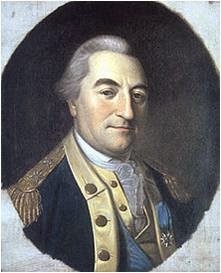 Before he ran, he ordered his right flank under General Baron de Kalb to attack the British militia. Under de Kalb, the Continentals fought hard, but they numbered only 600 to 2,000 British troops. Cornwallis ordered Tarleton's cavalry to charge the rear of the Continental line. The cavalry charge broke up the formation of the Continental troops. 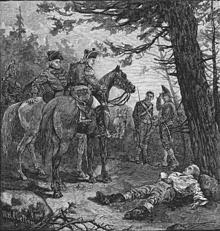 De Kalb tried to rally his men but was fatally wounded. After only one hour of combat, the Americans were utterly defeated, suffering over 2,000 casualties. Tarleton's cavalry pursued and harried the retreating Continental troops for 20 miles. The terrible route for the Americans at the Battle of Camden strengthened the British hold on the Carolinas that were already reeling from the capture of Charleston, SC, by General Sir Henry Clinton in January 1780. Here’s how Andrew, a character in my novel, The Chamomile, described General de Kalb. You see, General de Kalb wasn’t one of those officers that puts space between him and his men. He was one of us. Most times when we traveled, he didn’t ride his horse, but marched along beside us. Came around each night and shared the food and fire. Slept on the ground with us. And stories? He could tell some of the best stories. Knew how to share silence too. At Camden, we were pretty much beaten. Six hundred of us to their two thousand. De Kalb sent his horse to the back of the lines early on, so he could fight side by side with us on foot. Time after time we charged, reformed, and charged again with the general leading the way. Someone laid his head open with a saber. He was shot. Bayoneted. Cut many times. But he still led one more charge. When the general finally fell, we closed ranks around him. Then Tarleton brought in his dragoons. We fought as long as we could, until most of us broke and ran. I was running for the woods with the rest of them, but I turned in time to see British soldiers headed toward the general to finish him off. They would have, too, but his aide, Chevalier de Buysson, threw his body on top of him and yelled, "No! No! It’s de Kalb. Brigadier General de Kalb." When the general died three days later, Cornwallis found out he was a Mason, same as himself. He had him buried with full military and Masonic honors. Susan F. Craft is the author of the SIBA award-winning Revolutionary War novel, The Chamomile. She has written two sequels to The Chamomile entitled Laurel and Cassia, which will be released in 2015 by Lighthouse Publishing of the Carolinas. Susan is represented by Linda S. Glaz, Hartline Literary Agency. Interesting post, Susan. My great 5x grandfather and his 3 brothers fought in that battle. My grandfather was wounded and walked with a limp until the day he died. It was fun hearing about one of the battles he fought in. In Suburban Philadelphia, we have a DeKalb Pike, named in his honor. He was truly a heroic patriot. Thank you, Rebecca. He was an amazing man. Susan, Thank you for a very interesting post. I always enjoy reading what you have to share. Thanks, Melanie. I love sharing the information I run across. It helps remind me that these were real people caught up in and had to respond to something so much bigger than they ever could have imagined. Hi Susan - what a great post! I always love it when I learn something new about our country's history. There's so much detail that just isn't covered in school history textbooks. It's fascinating for me (I'm an admitted history nerd) to read the small details - helps bring history alive. Wow, Sharon, you made my day! I've written two sequels to The Chamomile. One that will be released January 12, 2015, entitled Laurel that takes place in 1783 and sweeps across the South Carolina backcountry, involved a grand jury murder trial in Charleston, and a ship wreck on Ocracoke Island. The second, entitled Cassia, if full of adventure, a sea voyage, slave ships, and pirates. It will be released mid-2015.